YOU COULD SAY that more than a quarter century ago Robin Ricks shone a beacon of light in the Idaho labor darkness, a light that continues to shine brightly today. Ricks was instrumental in launching the first labor union for the City of Coeur d’Alene in 1981. That achievement, even today, is unmatched in Idaho. The City of Coeur d’Alene remains the only unionized city in the state that has a collective bargaining ordinance. Indeed, Local 433, the Lake City Employees Association, also has the distinction of being the only local union in Council 2 that is located outside Washington State. It all began when Ricks joined the water department in Coeur d’Alene in 1980. In 1981, they came up with a plan aimed at putting a collective bargaining ordinance in place. The highly unusual plan was developed by a coalition of four groups: The City employees, the Coeur d’Alene Fire Fighters Union, the Kootenai Environmental Alliance and a Coeur d’Alene senior citizens group. It was an all-or-nothing plan, that called on the voters to either support the endorsed three council member candidates and the endorsed mayoral candidate as a group or vote for their opponents. By voting in the three candidates and the mayor they would ensure a majority on the council, which consisted of six members and the mayor. • Pass a shoreline protection ordinance prohibiting the construction of high-rise buildings along the shores of Lake Coeur d’Alene. • Develop a new senior center, which the council had refused to do for years. • Grant city employees collective bargaining rights through a city ordinance. The group called themselves the CCC, for Concerned Citizens Committee. During the campaign, yard signs bore four names. Vote for them all, the coalition urged, or none at all. 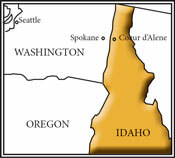 The result was the largest voter turnout in the history of Coeur d’Alene at that time. The package deal formula proved to be a great success. “After winning the election, the mayor, assisted by the three labor-friendly council members, kept their part of the agreement and helped us gain a collective bargaining ordinance for the City,” Ricks recalls. “The ordinance provided us with a backdrop of rules and regulations by which we all could live and work. It was an excellent contract which we negotiated with management. Today the 100 people who work for the City, whether in the sewer, water, library, parks or street departments, are all represented by Local 433. In June 1996, the Lake City Employees Association joined afscme and Council 2. But the battle was not over. In November 1997, the City elected a new mayor, Steve Judy, who, with the council, repealed the collective bargaining ordinance. “The City employees and Council 2, represented by Deputy Director Pat Thompson, decided to run an initiative campaign and put the collective bargaining ordinance to a vote of the citizens of Coeur d’Alene,” Ricks says. Over the years, Ricks has continued to work for the Water Department and he now has 33 years of service behind him. He has been president of the local five times, vice-president five times and an executive board member when he was not occupying one of those positions. He is also on the Council 2 executive board. Throughout that time the contracts have stood the test of time, Ricks adds. “We have been the lions at the gate.